Prolene brushes are made from a quality synthetic hair. They have a similar degree of spring to sable brushes and fine pointing qualities too. Colour holding is equal to any animal hair, but its finest asset is the ability to withstand the rigours of misuse and general wear and tear. Seamless nickel ferrules. 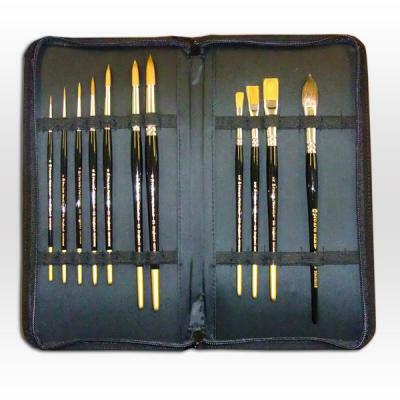 Black polished handles with gold tips. The set also comes with a Series 50 pure squirrel wash brush size small, whch is a great addition to this econonomical set. This excellent value set consists of a selection of 10 Pro Arte Prolene brushes and one Series 50 squirrel hair brush, all contained within a Pro Arte brush case. Prolene Series 106 Size 1/4"
Prolene Series 106 Size 3/8"
Prolene Series 106 Size 1/2"
The total value of the contents of this set is over £93!